At Tranquility Hill we have a cadre of competent, professional, and friendly guides headed by lead guides, Dwain Neymour and Ray Mackey. (Ray is only available by special request.) We take great pride in the experience and professionalism of our guides. Rather than use house guides, we contract with independent guides who own their own boats and equipment and have years of experience guiding in the Andros bights. 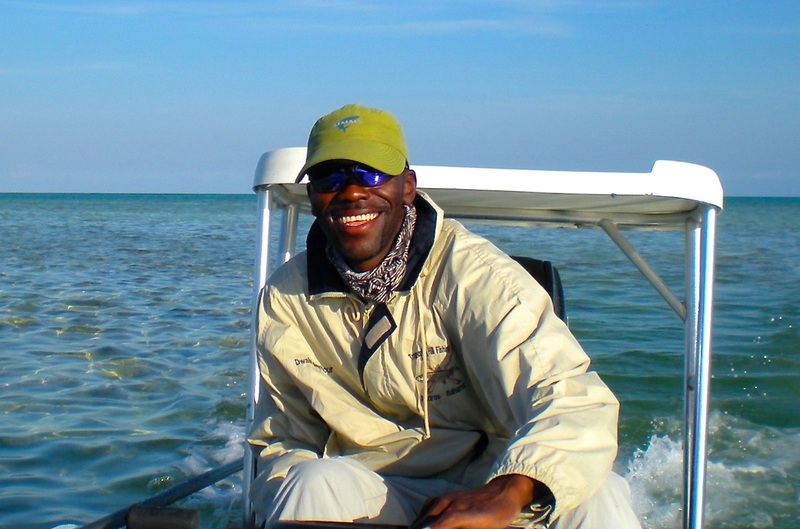 All of our guides make an effort to give you the type of fishing experience you are looking for. If you have any special fishing desires (you want to wade, concentrate on big bones, fish for tarpon or cuda) please tell your guide in the morning so, together, you can discuss the options based on current conditions. Normal fishing hours are 8 a.m. to 4 p.m., although an earlier start can be arranged. Our guides are also patient instructors, coaching you as much—or as little—as you want. They can help you improve your casting, stripping and hook-setting techniques, and fish-fighting skills. More importantly, they have great eyes for spotting those illusive bones and can get you in position—and within range—for a perfect shot. While all of our guides are excellent, we understand that many clients and guides develop special relationships over time, and we encourage these. If you have a guide you would like to fish with, please let us know far in advance. If the guide is available we will reserve him for you.